So – you’ve done all your research, or at least read Parakeets For Dummies , you’ve purchased and set up your cage, and you’ve decided it’s time to find your parakeet and bring him home. Picking a parakeet out is a lot of fun, but it’s also important to take care in making a final selection. Or, in my case, you turn to your husband and very dramatically say you can’t live one more day without having a bird! There are a lot of different ways you can find a parakeet, you can search on Facebook or Google for local parrot rescues and I would wager all of them have fistfuls of parakeets that need a good home. You can also search locally for hand fed parakeet breeders, which we’ll discuss further down the line. For our first budgie we wanted to start with as young a parakeet as possible, and we wanted to try bonding with him as an “only child”, most rescues will not allow you to adopt single parakeets if you have no other birds at home, because of their strong desire to be part of a flock. To that end, over a two-day period we made the rounds of every big box pet store in our area and cased each joint for their juvenile parakeets. We were looking for the following characteristics specifically. A parakeet that had all of the bars on his head, indicating he had not gone through his first molt at approximately 4 months of age. A cere that looked as though it would develop to be more blue than beige – in hopes of having a male parakeet. I know now I was a bit wrong-headed about this, in a budgie as young I was looking for a solid pink cere would have been a boy. This is how we ended up with a girl! Fully black eyes with no hint of an iris, which is another indicator of a juvenile parakeet. Temperament-wise, a parakeet that was not attacking other birds, but also who was clearly not bonded to another parakeet. No indicators of poor health, not puffy or overly sleepy, clear eyes and nares, feet in good condition, well-groomed and alert. 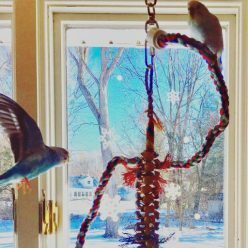 Also, it’s a good idea to assess the condition that the parakeets are living in – do they have access to clean water and perches, some toys, and do any of the other birds in the cage look ill? Parakeets, even in a pet store environment, should seem pretty happy; you want to see lots of playing and singing. 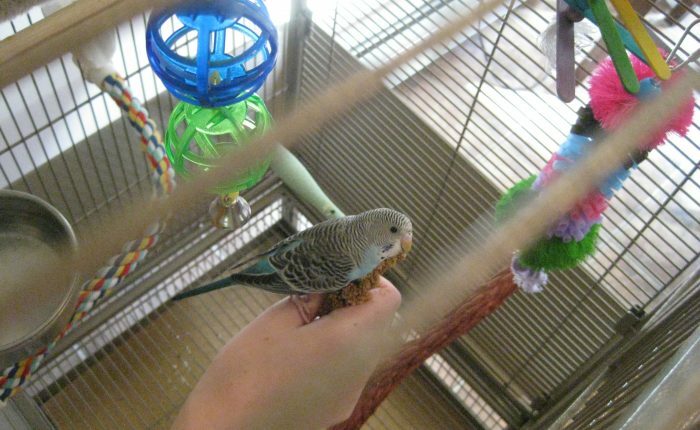 It took us four stores to find our parakeet, she was the youngest we had seen in any of the locations, and through she didn’t seem afraid or traumatized, she was also clearly not best pals with anyone yet. We found an employee and let them know we were ready to purchase. I was mildly alarmed by the fact that they didn’t ask whether we had everything needed to house and care for a parakeet, even if only to sell us on a few more items! Instead, we watched in semi-horror as our new family member was caught with a net and unceremoniously deposited into a cardboard box, $20 later and we were on our way, driving home listening to the sound of parakeet nails slipping around on cardboard and probably both wondering what the heck we had just done…. Reservations aside, it was time to introduce Toby (named after both the demon in the Paranormal Activity: The Ghost Dimension series and the put-upon HR Rep in The Office: The Complete Series to her new home.